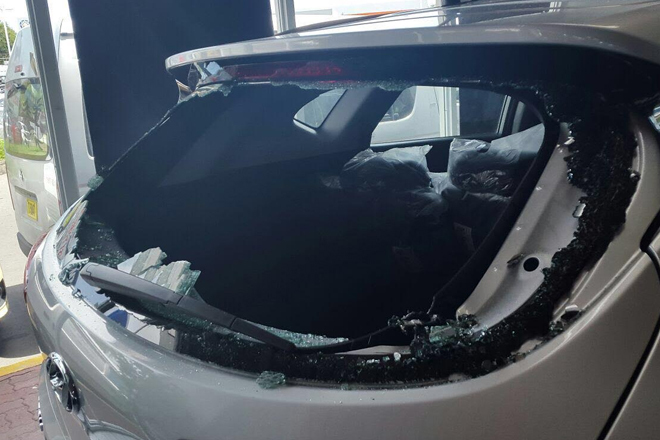 (ZIZ News) — A man has been taken into police custody after smashing the windows of several vehicles at Horsfords Automotive Division on Friday. According to general manager Alexander St. Juste the man came in the previous day to buy six vehicles, but he made arrangements to return on Friday with the money. However Mr St. Juste says when he came back things took a turn for the worse. “So when he came this morning he come to me and asked if the vehicles are ready but I told him that the vehicles can’t be ready because we need the cheque to pay for the vehicles first. We have to pay Customs and the VAT before we put them on the road. He left and he went out the door,” he said. ZIZ understands that the man has been identified as Earl Allister Thomas and amateur video shows citizens restraining him until the police arrived and took him into custody.